For the past several weeks Sebastian and I have been working through Essentials 2nd Edition from Logic of English. Logic of English is a complete Language Arts curriculum that is geared to work with multiple levels at once. This is a great fit for homeschool families or a classroom that has tiered learning. It incorporates multiple styles of learning. 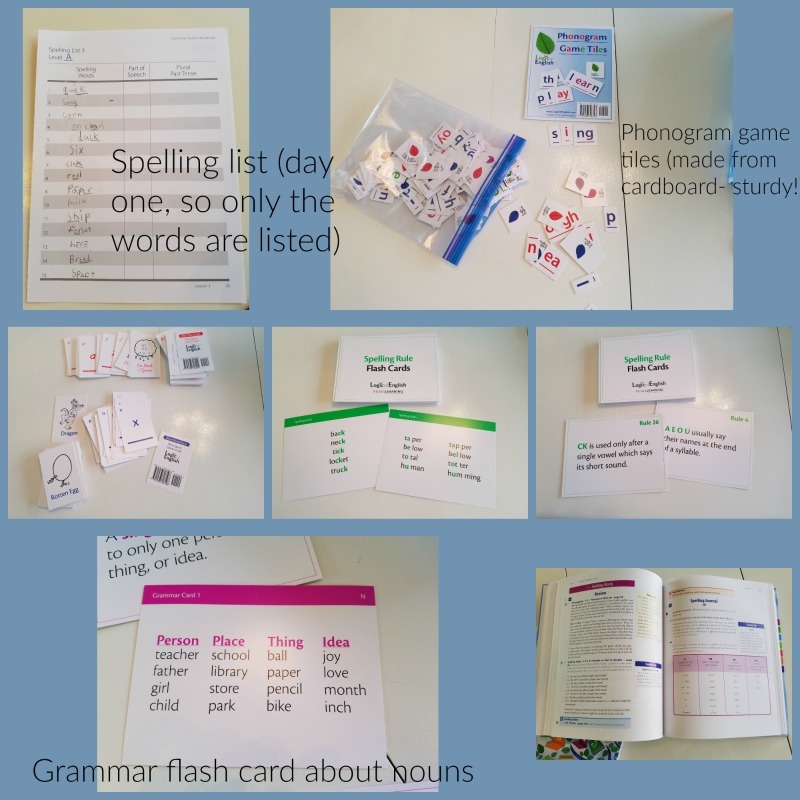 It is geared for ages 7 and up and includes everything you need: Essential's teacher's guide, student workbook, phonogram game tiles, phonogram game cards, spelling journal, basic and advanced phonogram flashcards, morpheme flash cards, spelling rules flash cards, grammar flash cards, as well as spelling analysis card and phonogram and spelling rule quick reference guide. Everything we received in the box. The first thing I did was read through the introduction in the teacher's guide. It explained the program and how to teach it. As I read through how to do spelling analysis, I was a little overwhelmed, but in practice it was easy.On page 41 of the teacher's guide there is a section on Teacher Tips. This was a great section to bookmark and as I had problems, I was able to read it and it helped make the program smoother and more successful. In this program there are three levels: A, B, and C. There is a placement test in the teacher's guide on pages 44-47 that will help you place your students in the level they belong, as well as suggest activities for areas your student might be struggling. I learned my son was in level A, but we needed to review a few of the phonograms because he didn't know *all* the sounds for some of the letters. My son, being a goof and playing phonogram dragon. The program is based on one lesson being covered in five days, so we worked on the program everyday Monday-Friday, but you could easily space it out longer. There are 15 lessons, so this book could be covered in half a year if you do a lesson a week, but it would be easy to make it last a year by spacing out the days and doing more review games in between. There are pre-lessons in the book for areas that kids might have struggled, but my eight-year-old didn't need to go over those lessons. Instead, we moved on to lesson one. Each day for each lesson is the same, they just build up with rules. Day one is Essential Concepts, day two is Building Words, , day 3 is Words in Context, day 4 is Words in Action, and day 5 is Check Your Understanding. An example of the flash cards you use. On Day One, Essential Concepts, you typically will introduce the concepts that are being taught in the particular lessons. 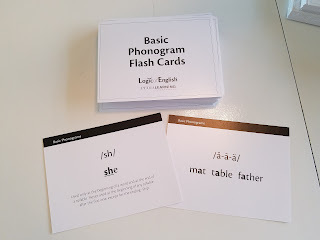 It might be new phonograms, a spelling rule, a grammar rule, and/or some other concepts. The teacher's guide has a script for you to read and it tells you exactly what to do. It makes teaching language arts a no-brainer! 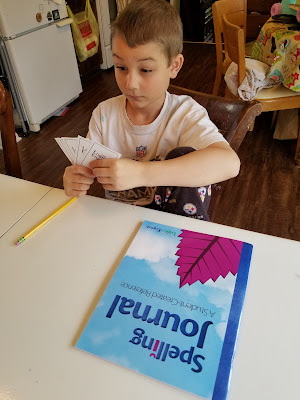 On Day Two, Building Words, you review the concepts that were taught, usually by playing a game, and then you work in the spelling journal bu collecting words that were taught in previous lessons and putting them in the journal where they belong. Then you use the Spelling Analysis and go over the words for the week with your student. On Day Three, Words in Context, you continue reviewing previous lessons and add in new rule, usually a grammar rule. Examples include talking about parts of speech like nouns and adjectives. 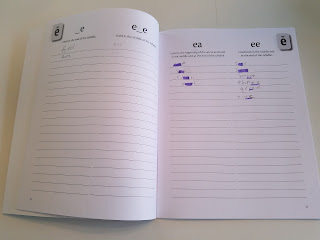 We then identify the parts of speech for the vocabulary list for the week and work on dictation. On Day Four, Words in Action, there is more review, more extension of what they are learning in the lesson, vocabulary, and practicing what they know with dictation, reading, and composition. 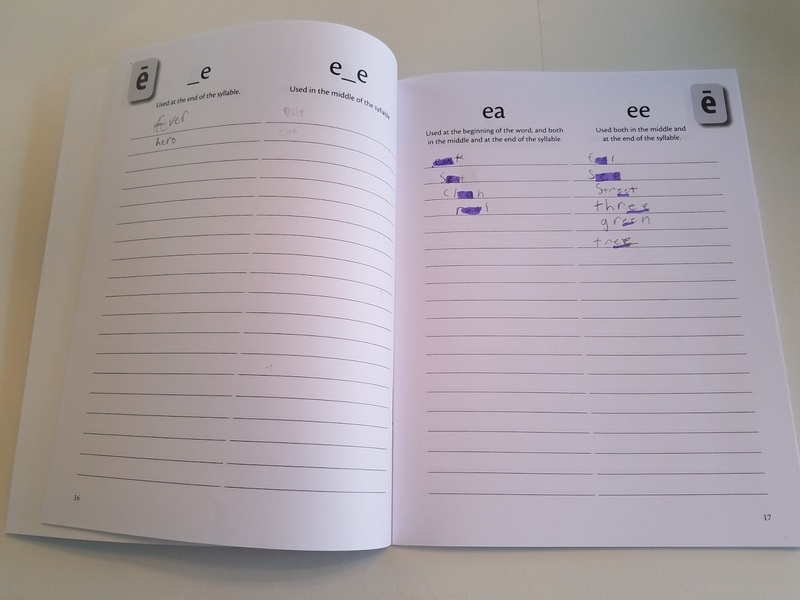 On the final day, Day Five, Check Your Understanding, everything is reviews and longer dictation of the spelling list words is used to test students. Although it seems like a lot of review each day, it is done in a way that builds upon what is learned every day. The students dig deeper each day and it helps with understanding and retention. What did we think about Logic of English, Essentials, 2nd Edition, volume 1? I liked it. It was very structured and it was easy for me to know what to do and do it. It also didn't take too long each day so we were both able to stay on track and engaged. Sebastian enjoyed the games, flashcards, and anything that wasn't writing. He hates writing so when it was time to do the spelling list he would pitch a fit, but that is just my son for you. It has nothing to do with the program. The Essentials 2nd Edition Complete Set- Volume 1 retails at $198, which saves you $23 from buying all the pieces individually. What is even better, is that the only consumable pieces are the workbook and the spelling journal! 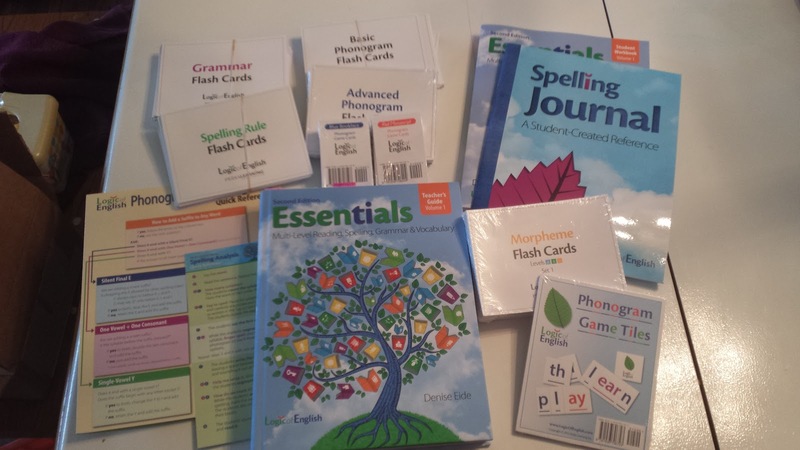 For each additional student, you would only need to purchase an additional Spelling Journal for $6 (or you could get a PDF for $4.80 as a family license) and a Workbook for $12 (or the PDF for $9.60). Overall, this is a good deal for a family looking to minimize costs. Volume two, which would be an extension of this series, is set to be released in January 2017.